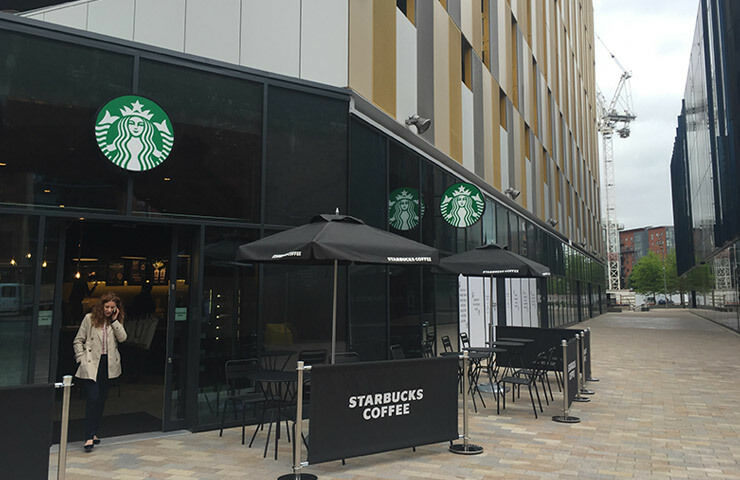 We are excited to welcome customers and visitors from around the Greater Manchester area to our brand new Starbucks store in the city’s new development, First Street. Located in between Deansgate and Oxford Road, the store opened on Friday 27th May and serves seven days a week, creating over 12 new jobs in the area. Ideally situated within the new retail and business district alongside a student accommodation and a five-star hotel, the store will offer local students, commuters and community members a place to relax and enjoy a cup of coffee, served with smile. We held a soft opening of the store on Thursday 26th May which was attended by the team from the Queensway Support Office, Starbucks Company and friends and family of the in-store team. We teamed up with a local charity, The Wood Street Mission, who help children and families living in poverty within the Greater Manchester and Salford area. All proceeds from our soft opening were donated to this excellent cause. The store is located on Starbucks, Unit 7b, First Street, Manchester, M15 4FN and will be open 7am-8pm Monday-Friday, 07:30am – 8pm Saturdays and 8:30am-7pm on a Sunday.